“Saturn is a gas giant planet, nine times wider than Earth, and mostly atmosphere. We don’t see its surface as such, but the top of its clouds. That means we peer down on a wildly dynamic environment, in some ways like Earth and in others, well, alien. And sometimes both. Sitting over the planet’s north pole is a vast circulation pattern of gas called the north polar vortex: 20,000 kilometers (12,000 miles) across, it forms a surprisingly regular hexagon, with winds and storms churning around inside it. 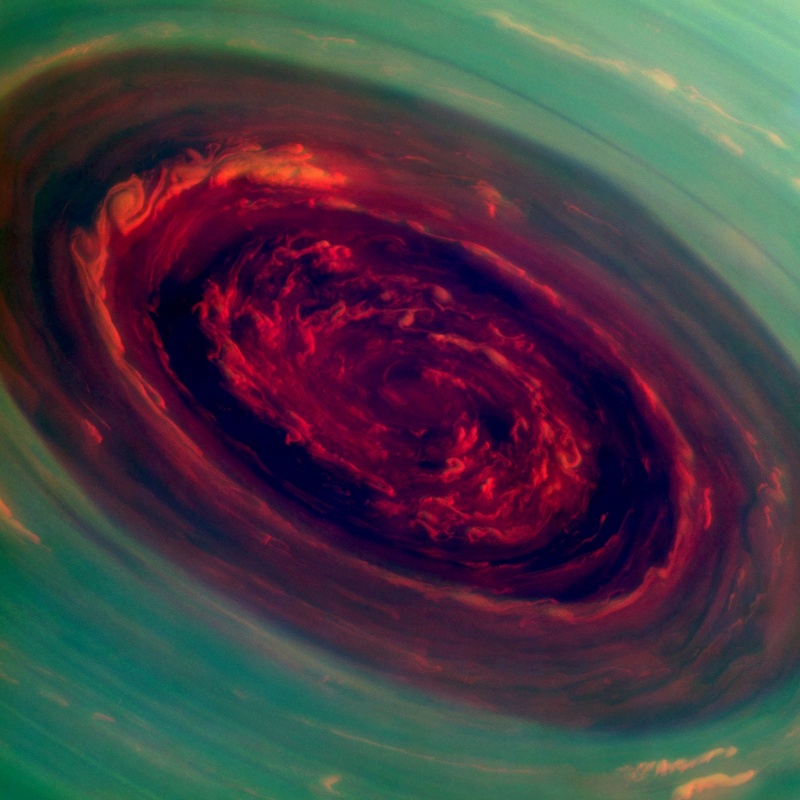 The images were taken by the Cassini spacecraft, which has been orbiting the ringed planet since 2004. In it you can see difference between the inside and outside of the hexagon; scientists can use these images to understand better what’s going on in Saturn’s complex atmosphere, including what material is in it, the sizes of the particles, and the temperatures of the gaseous constituents as well. Incidentally, see that big whitish circle near the bottom of the vortex? That’s a storm roughly 2000 km (1200 miles) across: comfortably larger than Texas. 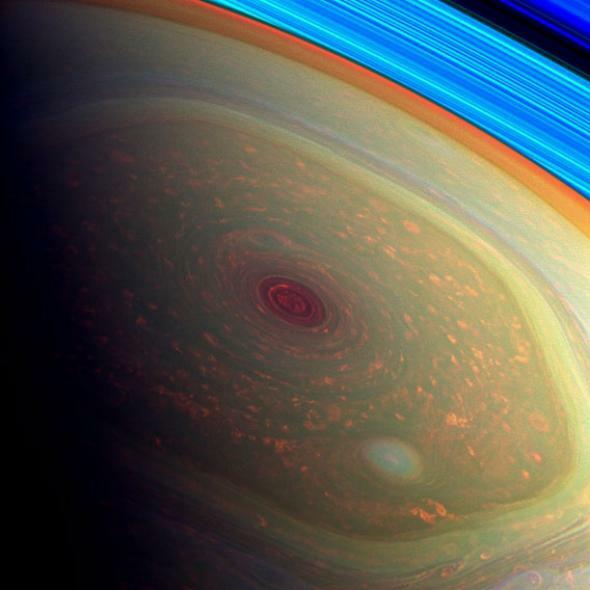 The huge hurricane in the very middle of the hexagon has also been seen in staggering detail before as well. The hexagon looks freaky, but it’s actually not that surprising; we see similar things on Earth in our own jet stream (called Rossby waves). What I find most interesting is not that it exists at all but that it’s so symmetric and well-defined; on Earth it’s sloppier. Saturn spins far faster than Earth does (its day is about 10.5 hours long), so, coupled with its larger size, the Coriolis force is far larger there, helping define the vortex’s shape. This entry was posted in Science and tagged astronomy, Jet Stream, NASA, north, Phil Plait, planet, polar, Psychedelic, Saturn, science, space, vortex. Bookmark the permalink. it’s a living thing, brought to life, and if it is spinning so much faster than earth, it would be reasonable to assume, that the slower we go, the better it will be for all. in a nutshell, it reminds me of the mind, once we loose control of it, it can for anywhere, and the world in my humble opinion was getting out of control, so perhaps, these revelations are a great reminder to us all, of the delicate nature of our planet. super images, reminds me of a certain abyss. i have captured images in the sky, that are also very revealing.